You might remember the last recession. Unemployment jumped from 4.8% to 10%. The S&P 500 Index dropped more than 55%. It sent such a shockwave through the business world that it was given the moniker of “Great,” though it certainly didn’t feel so great when it was happening. That recession officially ended in June 2009. Many argue the recovery has been unusually weak. They’re right. Economic growth per month is lower than in any previous recovery. But slow growth is still growth. And, the economy grew for the past 113 months. That means, officially, it’s the second-longest economic expansion since 1950. And, its age is something to worry about. The longer the expansion lasts, the closer it is to the end. We don’t know exactly when the recession will begin. But history says the stock market will turn down before the recession starts. 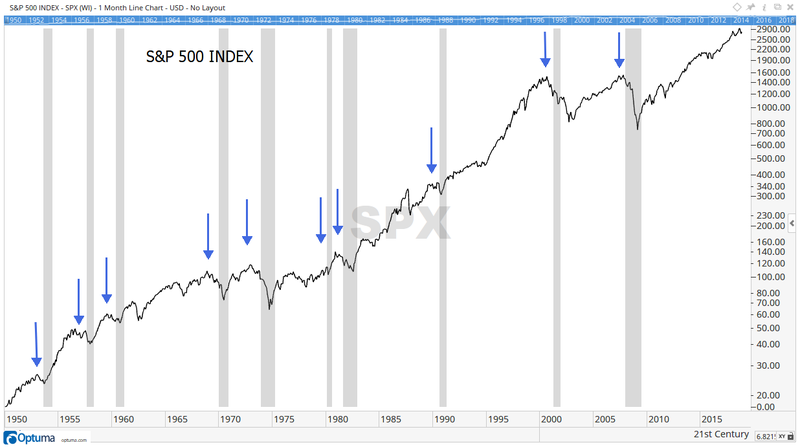 The chart below shows the S&P 500 Index peaked before each of the 10 recessions since 1950. Grey bars highlight recessions. Lead time varied from one month to 13. On average, the S&P 500 peaked seven months before the recession. Officially, the National Bureau of Economic Research (NBER) decides when recessions begin and end. It also defines what a recession is. Many investors believe a recession requires at least two straight quarters of declining gross domestic product (GDP). That’s not true. In 2001, there was just one quarter when GDP declined. Instead of using GDP, the NBER looks for pronounced, pervasive and persistent weakness in several indicators. It considers income, employment, industrial production, retail sales and other data. Right now, those indicators are growing. But this is about as good as it gets for the economy. From here, the indicators can only turn down. That puts us on a path toward recession. So, we need to look closely at the recent market weakness. If a recession is near, that decline was the start of a bear market. And, it should be a steep bear market. On average, the S&P 500 fell 37% during bear markets associated with recessions. The last two recessions saw bear markets with stocks falling more than 50%. For comparison, bear markets that occur during economic expansions lose an average of just 23%. It is possible to sit through a 23% decline and recover in a respectable amount of time. But facing potential losses of 37% or more, investors need to consider becoming defensive. Defensive strategies should not include selling all stocks and holding only cash. There is always a chance the stock market could go up. Being 100% in cash means missing out on possible gains. That’s why most large investors maintain some exposure to stocks even in deep bear markets. Alternative strategies include taking some profits off the table and letting those gains sit in cash. Some investors might want 20% or more of their portfolio in cash. Or, investors could buy inverse exchange-traded funds (ETFs) or put options on ETFs. Inverse ETFs increase in value when stock market indexes decline. Now, this sounds like a technical note — the funds are rebalanced daily. That means inverse funds won’t track the target index in the long run. It’s possible the index could decline, and an inverse ETF could still lose money. Put options on ETF like the SPDR S&P 500 ETF (NYSE: SPY) could be a better strategy. Puts give buyers the right to sell shares of the ETF at a specific price until the option expires. They increase in value when prices fall. A small purchase of puts could protect a portfolio against large losses. It’s a strategy all long-term investors should consider now.